The man was running alone on the park’s West Ridge Trail when he was attacked from behind, according to an initial Colorado Parks and Wildlife release. The animal was later identified as a juvenile mountain lion, possibly weighing about 80 pounds or more. Nick Clark is an avid ultrarunner from Fort Collins who ran to the top of Horsetooth Rock earlier Monday. He lives near the Larimer County-managed open space and said he’s probably run in the park a “couple thousand times” without seeing a mountain lion, though he has seen their tracks and deer they have killed. Obviously, you shouldn’t get close enough to a mountain lion to measure it, so another way to tell if you spotted a mountain lion is to inspect visible tracks in the area. A cougar’s paw print has a distinctive “M” shape, with three lobes on the bottom compared to two lobes on a dog’s paw print. Mountain lion attacks on humans are rare. The best way to protect yourself is to keep your distance and not approach wildlife. Use the rule of thumb: If the animal is small enough to cover with your thumb, you’re at a safe distance. As for keeping your pets safe, keep them on a leash. Don’t feed your pets outside, and keep them indoors at night if you can. If you keep your pet outdoors, a kennel with a secure top is a good idea because mountain lions can climb fences. 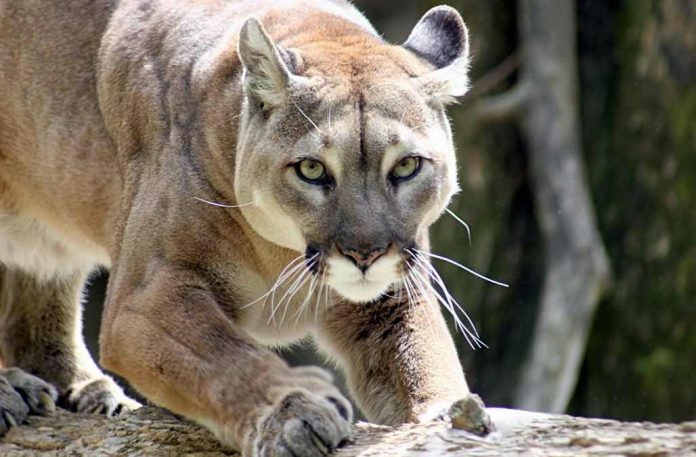 If you think you saw a mountain lion in an urban or unsafe area, report the sighting to CPW’s Northeast Region Office at 303-291-7227 (not Larimer Humane Society). Reporting sightings helps CPW determine an animal’s whereabouts and what, if anything, to do about it.